The String Stretcha makes the tedious task of stretching strings much eaiser. Changing strings can be a bit of a pain at times. You get your new strings all wound on and tuned up, but then your guitar just keeps going out of tune. Strings need to be stretched before they hold tune. The standard finger and thumb stretching technique works, but can be a bit cumbersome for newer players and experienced ones alike. The String Stretcha is here to make the tedious task of stretching strings a whole lot easier. No longer do you have to risk breaking your new strings from accidentally over-stretching. Made of crush-resistant epoxy material, and crafted in a ergonomically shaped way, the String Stretcha makes light work of stretching strings. The String Stretcha has a hook and heel that act as pivot points, and stretches the string in a similar way to the finger and thumb method. It works in a much more consistent manner than the traditional method, meaning that strings are stretched much faster and efficiently. I put the String Stretcha into practice on two of my guitars. My favourite strings are Dunlop Nickel Electric Guitar Strings. I really like the tone, and they are nice and quick to stretch. I used these when testing out the String Stretcha, and it really didn’t disappoint. The String Stretcha was really easy to use, and made light work of getting my new strings to stay in tune. It took only three passes over each string to get them to hold tune, and it did really only take around five minutes to get then to this state. The String Stretcha feels really solid, and you just know that it’s going to last quite some time. This is great, especially since it’s such a cheap tool. It’s very comfortable too, much more so than the traditional method of stretching strings. 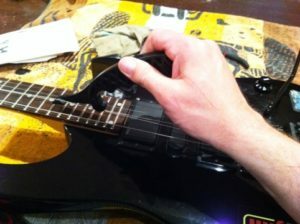 Overall the String Stretcha is an extremely handy tool to have lying around for string changes. It makes light work of stretching, and is so keenly priced there’s no reason not to have one. Beginners and experienced players alike will find it very useful to have a String Stretcha in their tool box. 2 Responses to "String Stretcha – review"